Something very interesting has occurred recently, the nature of which I would like to recount here, as a means of both sharing as well as gaining insight from others. As some may know, a group of us moved here to SLC several month's back as a means of congregating in one place, to see what might manifest as a result of the aggregation of like-minded individuals, each on the road towards evolution and the expansion of the self; while at the same time working to make grander goals a reality. As part of this process, each of us has experienced a great deal of personal growth. Such will happen when one chooses to take this road of individuation. I myself can attest to the fact that I have personally experienced several 'synchronistic' type of events these past several months, the nature of which have provided great insight into the inner workings of life and the universe. Please allow me to shed a bit more light on the most recent of these events; an occurrence that has confirmed for me the very real existence of the phenomenon known as 'reincarnation'. When first I arrived in SLC last fall, I immediately stepped into the role of director for three separate group homes for special needs adults; a field in which I have a great many years of both personal as well as professional experience. What I did not realize at the time was that the laws which govern the care for special needs adults here in Utah are a complete and utter farce. Never in my life had I experienced such a chaotic and disorganized system, from the State level on down. Without getting into too much detail, I was working 50-70 hour weeks, and getting paid for 40. There were NO PROTOCOLS in place for the training of staff, feeding and clothing the special needs adults, etc. It was a disaster, and I was personally driven to extreme levels of anxiety, having been thrust aboard a sinking ship. For three months, I worked my tail off to bring some semblance of stability to an absurd situation, and in the process, burnt myself out. After three months, I had to step away, and thus re-evaluate. For the three months which followed, I took a step back (sans employment of any kind) and gathered myself back together. It was a massive personal struggle, and much has been gained in the process; in terms of personal understanding, that is. At last, I began a search for a new job, and was courted by several companies, at rates of pay equaling or in excess of that of my previous directorial position. However, after very careful consideration, I made a rather interesting choice: I accepted far less money to work a job at which I would undoubtedly find more happiness and personal fulfillment, i.e. I am working as a swim instructor for infants and children. Being around these little folk has always been a great source of personal fulfillment for me. Now, fast forward to last Friday evening, May 19th. I was teaching a class with a five year old girl named Elizabeth; my second such class session with her. At the end of the session, I got an interesting and curious feeling from Elizabeth - there was some sort of instant connection between us, some type of familiarity that I could not quite pin down. I had recognized this on the previous Friday (May 12th), and it was confirmed for me on May 19th. There was something about the non-vocal communication that was experienced between us the very first time our eyes met. I could not put words to it, but on the 19th, I had an innate curiosity that something was drawing us to one another. Now, bear in mind that she is one of the kindest and most sincere young children that I have ever met. This was my very first impression of her; despite having already taught lessons to dozens of other rather adorable children. Something about her was strangely familiar. This is important. On the 19th, I had at one point looked out into the main lobby of the school and saw a man who looked like the spitting image of my Uncle Carmen. I even remarked aloud to one of my co-workers the nature of the similarity. After teaching Elizabeth (my last class session on that day), I was sitting around the pool with my co-workers evaluating the successes of the day's events, when I suddenly had an image of Elizabeth in my mind, and felt compelled to turn around and look for her in the lobby. At the very same moment that I did so, I saw that she too was turning around to look for me as she walked out the door of the building. Our eyes met, and we waved at the same time; at which point I noticed that the man who was the spitting image of my Uncle was in fact her father. This is also important. On the previous Friday the 12th, two interesting things occurred: 1. My Uncle Anthony posted a picture of my beloved Grandmother Mary on Facebook, wishing her a happy mother's day (she passed on several year's ago.) Mary is the mother of my own mother, and Anthony and Carmen are my mother's siblings. I recall having glanced over this Facebook image of my grandmother on the very same day on which I first met Elizabeth. ALSO, on the night of the 12th, I had a dream that took place in my Grandmother's backyard. I did not until later connect two and two together, i.e. the picture of my Grandmother that I saw earlier in the day on Facebook sparked the dream, subconsciously. In between, I met Elizabeth. Another interesting thing of note: On the 12th, I had a private lesson with Elizabeth, as the other children scheduled in the class on that day did not arrive. On the 19th, Elizabeth was the first to arrive to class. I had assumed that she and I would once again have a 1:1 session. Several minutes into our lesson, three other children arrived late. When they did so, there was a look of 'surprise' on Elizabeth's face. She was not disappointed nor sad, just surprised; as if the fact that others were coming to join she and I in the class was in some way interrupting our time together, and this was confusing to her. To sum up: On the 12th was the first night that I met Elizabeth. The first thoughts that came to my mind after meeting her were, "that is the kindest little child that I have ever met." On the 19th, the series of synchronistic events that had led up to that point, and the feeling of 'something strangely familiar' that I had experienced when around Elizabeth prompted me to come home that evening and state to Joey and Spaceman, "I am just throwing this out there, as it's only at this point a 'feeling'. There is something familiar about this child Elizabeth, something that I recognize, some connection, but what that might be, I have no idea. I do not want an answer, but I just thought that I would mention this out of sheer curiosity, to get your thoughts on it." Joey, being as he is quite knowledgeable in this area, led me through a series of thoughts pertaining to my recent dreams, which, strangely enough, related to parts of my past, and to current conflicts occurring NOW in my psyche. This led me to remarking, without thinking about it, that my beloved Grandmother Mary was one of the kindest people I had ever known; at which point I spoke of her important influence upon my life. This word 'kindness' kept coming to mind. Joey KNEW where this was going, but I needed to come upon it myself. At that point, I suddenly had an epiphany, and remarked, "Is Elizabeth the reincarnation of my Grandmother?!" A wry smile came to his face, which in turn subsequently led to a five hour conversation concerning the possible nature of the phenomenon of reincarnation. All of us seemed to agree that what was being proposed was most certainly possible; only, it was the details concerning the nature of reincarnation itself that led to a debate of some depth. After having recounted the series of events above, I have NO DOUBT that I have been led by fate to this job and to this child. This little girl has sparked some strange sense of curiosity, knowing, and familiarity for a reason: I am fairly well convinced that I am looking into the eyes of the reincarnated version of my beloved Grandmother, and I am misty-eyed in even considering the thought. She even has the same type of body build that my own grandmother had as a child; and again, her father is the spitting image of my Grandmother's eldest son, my Uncle Carmen. When one begins to take a road in life that is IN TUNE WITH THE TENETS OF NATURAL AND UNIVERSAL LAW, very interesting things begin to manifest; to those who understand how to pay attention to and interpret the messages. During my time in SLC, several such events have already occurred, but this is undoubtedly the most profound of them. I am beginning to understand how it is that life communicates; how life TRULY communicates, that is, beyond the purely physical realm of space. Now to perhaps the most important part: This child has also been led to me. It is a reciprocal encounter of kindness and familiarity. I could ask so very many questions here, but what I must do, over the course of these next few days, is to meditate deeply upon what is occurring, as there is quite obviously a reason why Elizabeth and I are coming into contact now. There is something to be gained out of this, for the both of us. I seek to understand the nature of this. Again, I ask not for answers, but merely for guidance. Billy, do you have the year in which your Grandmother passed away, and the year in which little Elizabeth was born? Before jumping to conclusions, you may want to run a simple test. Elizabeth could just be someone in your soul group--most of whom will have that kind of familiarity. One of the strongest carry-overs between lives is aroma. Never figured out why. So to check, find an aroma that is fairly unique to Mary (perfume, perhaps a specific food she liked to cook) and expose Elizabeth to that aroma--without saying anything. If she is Mary, then you'll get a response like "oh, I love that perfume!" or something like that. But you cannot "hint," like asking "what do you think of this perfume?" It has to be a spontaneous reaction. My grandmother passed away on February 13th, 2000. I actually did think about this, i.e. how much 'clock time' has elapsed between the time of my grandmother's passing, and the birth of Elizabeth. I do know that Elizabeth is five years old, but I do not know her date of birth. Elizabeth could just be someone in your soul group--most of whom will have that kind of familiarity. If that is the case, then I am equally fascinated, as I still see our meeting as being anything but arbitrary, and wish to find out more. As a side note: As part of the presentation that I am putting together on herbalism, I have come upon some interesting correlations between the aromas of certain herbs, and their corresponding organ affinities (doctrine of signatures) and medicinal actions (both physically upon the body and more subtly upon the sensations experienced through the soul). To my knowledge, there has not been very much research done in this area, which leaves it wide open for discovery. Interestingly enough, most of the tales told by the herbalists of old, pertaining to specific uses of plants for aromatic purposes, have to do with the healing of those who crossed over into the realm of the little people. I have a few aromas in mind, cedar wood being one. I am working on finding out about specific fragrances that were unique to my grandmother. Interesting thing is that this is one of the first things that I noticed about Elizabeth: I believe that she wears some type of lotion that makes her skin quite soft. This lotion has a pleasing and subtle aroma. It's not usual for children of her age to wear fragrance, which makes it unique. One final note on this, before heading off to bed: As Joey so succinctly pointed out, it would behoove me to approach this in a mindful manner. He made a point that there is a reason why we are not, by nature, born into each new life with the full scope of our memories intact. Stirring a feeling or a memory in a child such as Elizabeth, (one whom is still close to her past life experiences, and has not yet constructed the same types of walls so prevalent in most human adults), even if done in a simple manner (i.e. through a familiar aroma) may elicit a feeling of discomfort in her; and that would be the last thing that I would want to do. I find myself so caught up in the fascination as to the nature of what is unfolding that I did not stop to consider the consequences involved. Now that I have this in mind, I can approach the situation in a manner in which I hold a sense of reciprocal rapport in the fore of my mind, simply communicating non-verbally by saying, "Hello". Since aroma is retained by consciousness after death (why ghosts are attracted or repelled by incense) then further on into other incarnations, it would seem a logical conclusion that aroma is being transmitted across coordinate time (nonlocally), as well as coordinate space (as molecules). The memory of aroma would not be stored in the brain, but the mind (soul aspect of the brain). I've also noticed in my research that only organic aromas are retained; chemical odors are not. So perhaps there is a difference between aroma and odor. The organic aroma would have a "soul" aspect to it, whereas the chemical odor would not. I am hoping your herbalism presentation will address the temporal aspects of plants, that "transmission through time," that allows for functions such as aroma, as well as nonlocal connections to organs. Please feel free to share any thoughts that might come to mind. Ok then, just a thought: The purpose of meeting Elizabeth may simply be to help reconnect you with your own sense of innocence, and greater consciousness (the source of all that is), given what you've described about "living for your career," and having made a decision not to continue along that path, but rather, to find joy instead. What better than a child to help guide you back to your own original source of happiness? Especially one that reminds you of someone familiar, who may have shared a similar child-friendly spirit, as older folks commonly do when they age and revert back to being 'young' like 'children' in spirit once again. janto wrote: Ok then, just a thought: The purpose of meeting Elizabeth may simply be to help reconnect you with your own sense of innocence, and greater consciousness (the source of all that is), given what you've described about "living for your career," and having made a decision not to continue along that path, but rather, to find joy instead. What better than a child to help guide you back to your own original source of happiness? Especially one that reminds you of someone familiar, who may have shared a similar child-friendly spirit, as older folks commonly do when they age and revert back to being 'young' like 'children' in spirit once again. I got to see Elizabeth again this past Friday, and again, that same feeling of connection and familiarity. When first we saw one another, it was a mutual feeling of inner joy. We were both just very happy to be in one another's presence, but in a very genuine type of way. It wasn't forced. Just a feeling of genuine and subtle happiness being in one another's company. So, I did test out the aroma theory, but the surrounding environment, i.e. a chlorine and bromine-filled pool, was not really conducive to allowing natural fragrance to take hold. Ya'll are going to laugh, but just prior to my lesson with Elizabeth, I scurried out of the pool, into the break room, and retrieved a grapefruit from the fridge, one that I had purchased earlier in the day. I tore it open, rubbed the juice all over my face, and squeezed it in my mouth I mean, how else was I going to test this theory, as I needed to use a natural substance? (By the by, my grandmother loved grapefruits.) Doc Brown's words echoed in my mind, i.e. "It's a science experiment!" After the lesson, something interesting occurred: I was speaking with Elizabeth's mother, and they stated that they would be moving her to private lessons at the school, as they felt that she had really responded positively to our first 1:1 session, and that she would benefit more from private lessons. Her mom asked about keeping me on as the instructor, but unfortunately, they have her signed up for 1:1 lessons on Wednesday evenings, a night on which I do not work. I was, of course, disappointed, but I took this as the universe telling me that our time together would now be put on hold. I did make a point to tell the GM of the school, who will now be her 1:1 instructor, that if Elizabeth asks for me specifically, I would be happy to make an exception to this. This is no way means that I feel that the familiarity that I feel towards her ends there. I still do feel strongly that there is a special connection here, and will continue to muse on this. A final note on this is that, after the lesson, the school was opened for a family swim. Dozens of folks were in the pool, and I was lifeguarding. Elizabeth and her parents decided to stay for this. Though I had to keep a keen eye on the pool, roving up and down, it seemed as though, a great many times that I turned in Elizabeth's direction, she turned in mine at the very same moment, and we smiled at one another. Whatever it is, it's a really neat feeling. Agreed, this is an interesting point, but it also leads me to asking: How does this work? I currently find myself deeply immersed in a study of the nature of the levels of existence to be found in the universe (the three-fold and seven-fold structures). We here have had many talks about this, and I've come to find that truly, 'the devil is in the details.' So, again, it leads me to wondering how this works, as it's more than arbitrary - there are ways and means that govern this type of a connection, and I seek to understand the nature of this. Gopi: Elizabeth was born in 2012, sometime in February, I believe. Trying to find out her exact date of birth would be an odd question to ask, but I find it curious due to the fact that my grandmother passed away on February 13th of 2000, and her husband, my grandfather, (who has also been on my mind in an interesting way since coming here to SLC), passed away on May 4th of 1966. My grandfather is an interesting case, as all that I have ever been told about him is that he was absolutely the kindest, gentlest, most soft spoken and universally loved fellow. People really enjoyed being in his presence, as he had a very calming effect on others. I have also thought of him in all of this, for a variety of different reasons. I actually have an old photograph of him sitting in the dresser drawer beside my bed. Again, since moving to SLC, he has, from time to time, been on my mind. it would seem a logical conclusion that aroma is being transmitted across coordinate time (nonlocally), as well as coordinate space (as molecules). The memory of aroma would not be stored in the brain, but the mind (soul aspect of the brain). Interesting. So, if I am making the correct assumption here, the mind, being a mechanism intricately tied to thought, draws primarily from the the sector 3/spirit/animus level of existence. So aroma, as it is defined here, crosses through/into both the spatial and temporal coordinate systems, but is stored in the spirit realm, the realm of thought. I suppose that one of the questions that might arise out of this is: What is the total span of existence of an 'aroma', prior to it 'dissipating' and perhaps no longer being a part of the memory function? How many reincarnative cycles may pass wherein an aroma will still have access to a memory from Sector 3? This is not surprising, as the source of one (aroma) comes from a biological life unit organism, while the other (odor) is synthetic nature, i.e. a 'dead' substance. It is the very same comparison that can be drawn between herbal medicines, foraged directly from nature's garden, and pharmaceuticals, the latter being synthetic replications of organic molecules found in the natural world. Yes, research of this nature will be included in the presentation. if you are serious about exploring your grandmother's reincarnation, might want to learn from the masters about how to recognize someone who's been 'proven' to have returned 14 times: The Tibetans and the Dalai Lama. This is a subject that was discussed here years ago, in relation to the reincarnative cycles of the Tibetan monks, i.e. a child is chosen as the new bodily vessel, with consent being willingly given between child, family, and monk. It would seem that the choice is completely voluntary, and considered quite an honor. One thing that I have long wondered: What happens to the consciousness of the child once the consciousness of the monk inhabits the new body? Do they 'share' a space? After all, we are dealing with two distinct life and control units, now merging into one body. This is admittedly a subject to which I have not yet devoted enough time in terms of historical study. What I will say, however, is that I have, for some time now, viewed this current incarnation of the Dalai Lama as nothing more than a plastic shaman. Back in Minnesota, I was very close with someone who was at the cutting edge of neuroscience research, and this is exactly what is being taught at universities all across the country. All research is being driven towards this end. I was even told, "We've reached the limit in terms of how far the human biological brain and the mind can take us in terms of their functioning capabilities. The next step in our evolution is the merging of man with AI." Wow, just...wow. This is prevalent to this conversation due to this: http://2045.ru/attachments/29819/2a34e9 ... ce8a44.jpg The fellow on the right is Russian billionaire Dmitry Itskov, supposed founder of the Initiative. Either this fellow the Dalai Lama is of an ethical nature, and was forced into taking this picture, or, as it were, he fully supports this initiative to turn humanity into a race of mindless, robotic slaves, completely out of touch with the natural workings of the universe. If the latter is true, then I have a hard time believing that this Lama is anything more than a mere puppet on a string. 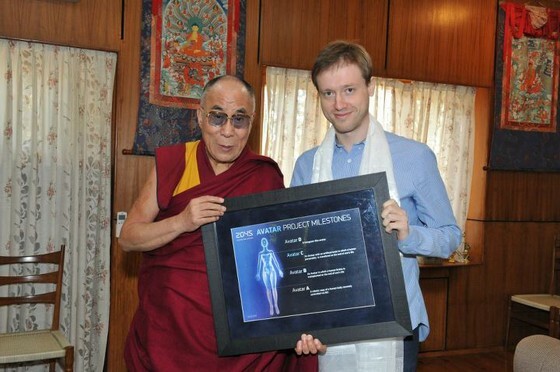 All of this is to say that if there is credibility to the history of the Lamas of Tibet, then it may in fact now be lost in our current age, as its supposed 'holiest of holies' gets a kick out of holding up giant iPads featuring pictures of robotic human avatars. How could a man such as this support such a project, knowing that there exist purely natural means to accomplish the very same results? After all, isn't he himself supposed to be the reincarnation of a higher spiritual being? So much for that. In simple, it boils down to: If Elizabeth is your grandmother, you'll be able to identify her by placing former objects of hers in front of her to identify, along with a pile of similar object which didn't belong to her, and allow her to correctly identify them without your influencing her. That would be a first test. Yes, that would be interesting, but unfortunately, it's not possible, as I only spend 30 minutes a week with her in a pool; though, again, that has now changed. Desperate time[-span]s call for desperate measures. So take my story as case in point for the quote. It can give you some additional comfort to your choice of the job as a swim instructor. Although, your statement that you would "undoubtedly find more happiness and personal fulfillment" should already be comfort enough! I'm happy for you - and your kids, since an instructor who'd rather be with them than getting a better paycheck elsewhere will definitely put his heart to work and be a good influence and an exemplary individual. Well, this reincarnation of a higher spiritual being sure loves a life in publicity. How often does he appear on television? Chushi Gangdruk was an organization of Tibetan guerrilla fighters who attempted to stop the invasion of the People's Republic of China (PRC) in Tibet. The Dokham Chushi Gangdruk organization, a charity set up in New York City and India with chapters in other countries, now supports survivors of the Chushi Gangdruk resistance currently living in India. Chushi Gangdruk also led His Holiness The 14th Dalai Lama out of Lhasa, where he had lived, soon after the start of the Chinese invasion. Now, whenever I hear the term guerrilla fighters I smell covert operations initiating the movement - at least as the last 70 years are concerned (foundation of the CIA), probably even before. So the term plastic shaman might be applicable from day 1! Summary—The CIA Tibetan program, parts of which were initiated in 1956 with the cognizance of the Committee, is based on U.S. Government commitments made to the Dalai Lama in 1951 and 1956. The program consists of political action, propaganda, paramilitary and intelligence operations, appropriately coordinated with and supported by [less than 1 line of source text not declassified]. Either this fellow the Dalai Lama is of an ethical nature, and was forced into taking this picture, or, as it were, he fully supports this initiative to turn humanity into a race of mindless, robotic slaves, completely out of touch with the natural workings of the universe. I'm curious, do you know the true natural workings of the universe? I'm not a historian, nor expert on this subject, so am not making any claims to specialty knowledge of any of this. Just pasting bits and pieces of research together to share, and ask questions, that's all. Do you mean that if he were truly spiritual, he should have stayed on his mountain top, hidden from the world? Pretend for a moment that you're the spiritual leader of a people and nation. What would you do to protect your people/nation when other powers are vying to impose their political will over yours? How would you handle it, when you've lived your entire life by a code of peaceful meditation, sometimes necessary resistance, but are forced into undesirable politics when faced with the real threat of a military invasion that would force your spiritually oriented society into adapting to "modern progress" or perish at the claims of a hostile invader? Not sure what that has to do with his spiritual reincarnation. He was formally recognized as the Dalai Lama in 1939, many years prior to any CIA influence. The first Dalai Lama having been established in 1578. The Chinese army invaded Tibet in Lhasa in the 18th century and thus became the origin of the tension between China and Tibet. With this tension came Tibetan resistance towards China and the United States' interest in helping them fight the communist party. In a memorandum from July 1958, the CIA described the growing resistance to the Chinese in Tibet. The memo says, "During the past two and one half years, resistance has hardened and grown despite Chinese countermeasures that include military force as well as partial withdrawal of Chinese cadres and postponement of 'reforms' and other programs leading toward socialization"  early 1950s, the CIA inserted paramilitary teams from the Special Activities Division (SAD) to train and lead Tibetan resistance fighters against the People's Liberation Army of China. The Tibetans were willing to fight against the Chinese they and the CIA had a shared interest in quelling the spread of communism from China into Tibet. The Tibetan people started to form anti-Chinese protests under the influence of the Dalai Lama. However, the government of Tibet did not encourage such anti-Chinese protest. The reasons behind the Tibetan people's motivation for the coup was because they perceived the Communist party, especially the Chinese, to be a threat to their religion: Buddhism the religion of Tibet is a form of Buddhism known as Lamaism. It is widely considered unorthodox within the Buddhist community due to its belief in animism. Not to confuse the definition of animism with animus. In his autobiography Freedom in Exile, the Dalai Lama criticized the CIA again for supporting the Tibetan independence movement "not because they (the CIA) cared about Tibetan independence, but as part of their worldwide efforts to destabilize all communist governments". In 1999, the Dalai Lama said that the CIA Tibetan program had been harmful for Tibet because it was primarily aimed at serving American interests, and "once the American policy toward China changed, they stopped their help." So Mao comes along and says, "we're going to modernize Tibet", because as he claims, "Religion is a poison" that must be rid of in favor of technological progress. This is what Mao tells the Dalai Lama in person. In effect, either the Dalai Lama cedes control of Tibet to China and agrees to a modernization plan dictated by China, as Chinese forces have already started to invade and kill off undesirables resisting their imposition, or there will be war and he will be rendered an occupied prisoner. Either way, centuries of buddhism in Tibet faces annihilation by a movement that claimed ~100 million lives in the 20th century. Don't get me wrong, I'm not for using force. But nevertheless, may be more to think about if it could happen to you?